"I have very little experience cooking Indian food, so that this came out as deliciously as it did is nothing short of amazing." Place lamb shanks in a large resealable plastic bag. Whisk together cider vinegar, oil, salt, tamarind concentrate, and garam masala in a bowl, and pour into the bag. Squeeze out excess air and seal the bag. Marinate in the refrigerator for 8 hours or overnight. Preheat an oven to 450 degrees F (230 degrees C). Grease a foil-lined baking sheet. 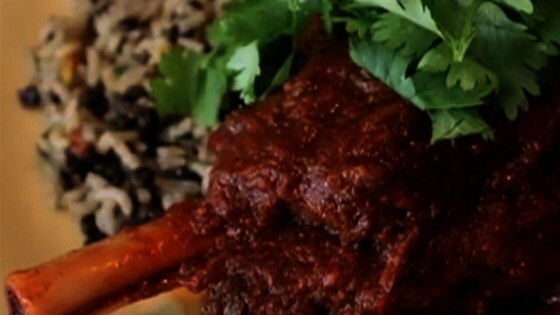 Remove marinated lamb shanks and place on the prepared baking sheet. Season all sides with salt. Roast in the preheated oven until well-browned, 15 to 20 minutes. Reserve marinade in the bag. Pour marinade from the bag into the stockpot, and stir in tomato-onion mixture and brown sugar. Bring mixture to a simmer. Place lamb shanks in the pan and reduce heat to low. Cover and cook, turning occasionally, until meat is tender and easily pierced with a fork, 3 to 4 hours. See how to make a spicy, Indian-style curried lamb stew. To make clarified butter, melt the butter over low heat and skim off the white milk solids. This recipe is not difficult, just time consuming...and so worth it!!! I do recommend watching the tutorial. It really helps in simplifying the process. What a taste explosion! Before starting the meal, realize that it is time consuming. My wife does not understand why I make meals that are so involved but...this was well worth the effort. Delicious and spicy but takes a long time to make!